A Chinese scholar who helped an activist escape house arrest has been released from jail conditionally, his lawyer said Tuesday, a move that comes ahead of Chinese President Xi Jinping's visit to Washington later this month. Beijing lawyer Li Jin said that Guo Yushan, founder of the nongovernmental think tank Transition Institute, was released late Monday, but she could not provide details on why he was freed or whether the release had anything to do with Xi's upcoming meeting with President Barack Obama. Guo was detained last October and charged in January with operating an illegal business. The charge remains, but can expire one year after his release. The scholar is best known for his 2012 efforts to help shelter the blind activist Chen Guangcheng in Beijing and send him to the U.S. Embassy there after Chen escaped from house arrest in an eastern Chinese village. Chen eventually made it to New York, after Hillary Rodham Clinton, then the U.S. secretary of state, negotiated for him to attend school in the United States. 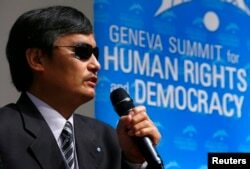 FILE - Blind Chinese dissident Chen Guangcheng addresses the sixth Geneva Summit for Human Rights and Democracy after receiving its first Courage Award, in Geneva, Feb. 25, 2014. Guo's Transition Institute conducted research on China's social and economic issues, but Beijing authorities, citing lack of proper registration, shut down the organization in 2013. Guo was detained at a time when Hong Kong protesters were demanding universal suffrage in elections for the semiautonomous city's top official. Dozens of other people also were detained for showing support for the protesters. Guo was not known to have made any public comments in support of the pro-democracy movement.